If there was one crop other than lemons I wish we could grow easily in the UK, it would be avocados. I would have an orchard full of them. Not only are they buttery and delicious, but they are also quite good for you. High in potassium, the unsaturated fats are said to be healthy ones and they are relatively low in calories. When I was sent a basket of ripe Peruvian Hass avocados, to say I was pleased was an understatement. I hadn’t known such bounty since CT and I worked on an avocado farm during our antipodean travels many years ago. We ate the fruit for breakfast, lunch and dinner. So in remembrance of times past, we cut into one almost immediately and had it spread on toast, just as we used to back on the farm when we used it as a butter substitute. Oh, how delicous. These avocados were particularly tasty with a gimme more creamy texture. Guacamole has long been a favourite of mine and makes for a very tasty vegan dip and accompaniment to all sorts of dishes. But I also find avocados have an affinity to eggs – maybe it’s the shape. One of my favourite party dips is an egg and avocado one and as I hadn’t made this for ages, I thought it was about time it was resurrected. What better accompaniment than some homemade spelt cocoa pitta breads, juicy sweet homegrown tomatoes and some crisp lettuce? The Great British Bake Off seems to have taken the world by storm this year and pretty much everyone seems to be talking about it. Last week was all about bread, so I thought I should join in the fun and get a little creative with flour, yeast and of course chocolate. Having a pretty good idea by now about pairing chocolate with savoury foods, I decided that adding some cocoa to my bread would marry well with the creamy eggy dip. I wasn’t wrong. My spelt cocoa pitta bread pockets, stuffed with the avocado egg filling along with some lettuce and tomatoes was pure heaven. The pitta pockets exhaled a chocolate fragrance on opening and were resileint enough to hold the contents. They had a soft and inviting texture and although thick were not in the least bit leathery – way better than any shop bought pitta breads I’ve had. The chocolate pitta also did a grand job of mopping up the juices of a vegetable stew. The avocado and egg dip was as delicious as I remember it. We both felt we could eat this again and again. Soft and delicious pitta breads with just a hint of cocoa to give added depth and flavour. Serve with a versatile avocado egg sandwich filling that can also be used as a tasty dip. Stir the yeast and sugar into the warm water, then combine this in a bowl with the other ingredients. Turn out onto an oiled work surface and knead for a few minutes - the dough will be sticky, but be wary of adding any additional flour. Place back into the bowl, cover with a cloth and leave to rest for about 30 minutes. Turn out onto an oiled work surface and knead again for a few minutes. The dough should have absorbed all of the water my now and not be so sticky. Cut into 8 pieces and kneading each one briefly shape into flat ovals, either with hands or a rolling pin. Place the ovals onto a lined baking tray (or two, depending on size). Place inside a plastic bag and leave to rise for about 15 minutes. Bake at the top of a hot oven (225C) for about 5 minutes when the breads should be lightly browned but still soft. Cover with a tea towel until all the bread has been baked. This will not only keep them warm, but keep them soft too. Roughly mash the avocados with the lime juice. Stir in the onions and pepper. Add the eggs and roughly mash into the avocado.4. Stir in the mayonnaise and pile into a serving dish. Top with the snipped chives. Thanks for visiting Tin and Thyme. 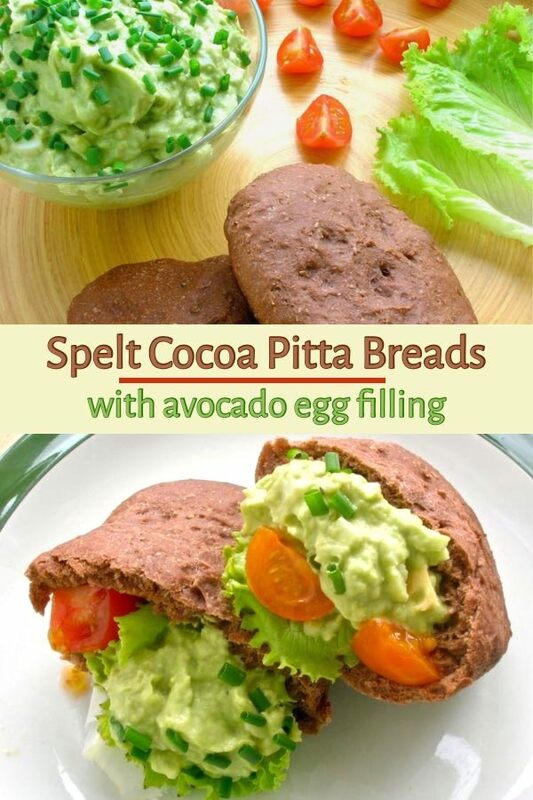 If you make these spelt cocoa pitta breads or the avocado egg dip, I’d love to hear about it in the comments below or via social media. Do share photos on social media too and use the hashtag #tinandthyme, so I can spot it. For more delicious and nutritious recipes, follow me on Twitter, Facebook, Instagram or Pinterest. Cocoa Spelt Pitta Breads & Avocado Egg Dip. PIN IT. oooh, yes please!… I really must try some more savoury chocolate baking, these look fantastic. I also LOVE the idea of avocado egg mayo, that’s totally up my street. I REALLY want to know what that combo all tasted like! Never heard of cocoa bread! bookmarking! Thanks,looks scrummy! Now that’s a revelation for me, I have never heard of avocado and egg dip, but I definitely fancy some now. Pinning to my Inspiring recipes board. My gosh you do come up with some fab recipes like this one. And I agree avocados in the UK would just rock. I agree I would love to have lemon and avacado trees in the back garden! Wouldn’t it be fantastic if we could grow them here. I’m the only one in our house who will eat them although I think your dip might be the persuader! Choclette, it has never occurred to me to mix avocado and hard-cooked eggs. Love them both, so I should definitely give it a try! I know the feeling Johanna – avocados can be really expensive here and I often buy them and they are all brown inside or never seem to ripen. There are loads of avocado growers up in NSW and Queensland – we ate quite a few on our travels. But the avocado farm we stayed on was in New Zealand. Chocolate bread? Woah! Now you’re talking! And yes….. bring on the avocado too….. Love them. Does the pink rock salt taste much different to usual sea salt? I’ve often wondered, but never tried it! Haha, yes, these were rather scrum my. As for the salt, I’m not really sure to be honest. I should do a taste test as I’ve been asked this question before. It’s meant to have particularly good minerals in it, so …!